I am currently starting a business with my dad. We are building and selling houses. He is also getting into other businesses and I am keeping the books for him as well in that. So I am definitely staying busy. This isn’t what I had planned on doing, but it was an excellent opportunity that I could not pass up. I’m living in Chipley, FL and having a blast! I hope all is well up there in good ol’ Tuscaloosa. 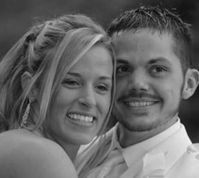 Update: Michele married REL major Jason Wright in April of 2005 (pictured at right). Congratulations! We’re so pleased to have helped bring these two love birds together.